జి. ఎమ్. ఆర్ సంస్థ, వారు కార్పొరేట్ సోషల్ రెస్పాన్సిబిలిటీ (CSR)* లో భాగంగా *శంషాబాదు విమానాశ్రయ ప్రాంగణంలో*ఉచిత ట్రైనింగ్ సెంటర్* నిర్వయిస్తుంది. దేశం లోని ప్రముఖ కంపెనీ అయిన జి. ఎమ్. ఆర్ సంస్థ, వారు కార్పొరేట్ సోషల్ రెస్పాన్సిబిలిటీ (CSR) లో భాగంగా శంషాబాదు విమానాశ్రయ ప్రాంగణంలో గత 10 సం|| నుండి ఉచిత ట్రైనింగ్ సెంటర్ నిర్వయిస్తుంది. ఈ శిక్షణ కేంద్రం ద్వారా ప్రతి యేడాది 1000కి పైగా 18 సం|| నిండిన నిరుద్యోగులకు 90 రోజుల పాటు ఉచిత శిక్షణ ఇచ్చి ఉపాది అవకాశం కల్పిస్తూ న్నారు. దరఖాస్తులకు పదవ తరగతి మేమో, ఆధార్ కార్డు జీరాక్సులు మరియు పాస్ పోర్టు సైజు ఫోటో తీసుకోని *ఈ నెల 25వ తేదీన* మా శిక్షణ కేంద్రానికి ఉదయం 9గ|| నుండి 12గ|| ల వరకు రాగలరు. మరిన్ని వివరాలకు *9494800102* ఈ నెంబర్ కి డయలు చేయండి. మా మనవి ఏమనగా ఈ మెసేజ్ ను మీ స్నేహితులందరికీ *వాట్స్ ఆప్* మరియు *ఫేస్బుక్* లో మీకు తెలిసిన నిరుద్యోగులకు పంపి వారి భవిష్యత్తుకి పునాది వేయగలరు. GMR Varalakshmi Centre for Empowerment and Livelihoods (GMRVCEL) - Hyderabad started giving training to youth around the Hyderabad Airport in 2006. In July 2008 a permanent residential center was inaugurated. The initiative is to provide short-term vocational training to the unemployed rural youth dropped out from school / college, especially coming from villages close to the airport.CEL-Hyderabad is a residential vocational training centre on the airport campus which trains over 500 youth every year in different trades. The Centre is equipped with classrooms, dormitory, work sheds, mess, library, recreation room, seminar hall, etc.The Center offers courses of short duration …ranging from 2 to 6 months. The training is provided free with preference being given to candidates coming from villages affected by the airport. After the initial socio-economic background check, candidates are selected based on an entrance test and a personal interview.As a policy, technical courses are offered in partnership with academic or industrial institutes to deliver the most industry-relevant content. Thus, Refrigeration and Air-Conditioning course is offered in partnership with Voltas, Micro-irrigation with Jain Irrigation, and Electrician training with Schneider Electric etc. It is the partners who design the curriculum, provide technical expertise, equipment and crucial components at on-the-job training as well as placement support.Besides the technical training, emphasis is laid on personality development and workplace readiness. Regular yoga, spoken English classes, soft skill modules, and mock interviews help the trainees in getting work-ready.Highlights:The Institute trained more than 2400 youth (1570 male and 830 female) so far and 2153 (1398 male and 755) of them settled comfortably. Some of them are working in Middle East in the field of Refrigeration and Air Conditioning.Some of them secured placements in companies like Voltas, Hero Motor Corporation, Vijaya Electricals, BIG Bazar, BL Kashyap, Volvo Excavator contractors and Schneider Electric etc. with salary ranging from Rs. 4000 to 12000/- per month.The Institute has reputed partners like Voltas, Volvo, Schneider, Hero Motor Corporation, VLCC and othersAbout 800 youth trained from villages surrounding Hyderabad Airport are placed with different concessionaries in the airport.Centre’s work was an important component in GMR Group bagging awards including Best CSR Activity to Rajeev Gandhi International Airport at the World Routes Conference in 2008 and TERI-CSR Award for Best CSR in 2009.The Institute has Vocational Training Provider (VTP) status to conduct Modular Employable Skills (MES) curriculum to issue Govt. of India National Council for Vocational Training (NCVT) certificate. More than 350 trainees received NCVT certificates. 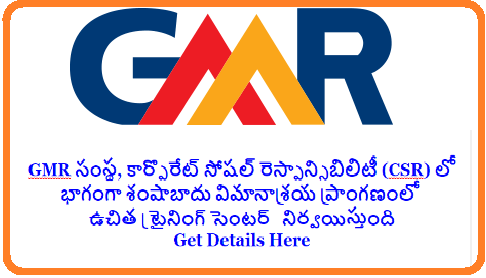 GMR Varalakshmi Centre for Empowerment and Livelihoods (GMRVCEL) - Hyderabad started giving training to youth around the Hyderabad Airport in 2006. In July 2008 a permanent residential center was inaugurated. The initiative is to provide short-term vocational training to the unemployed rural youth dropped out from school / college, especially coming from villages close to the airport. CEL-Hyderabad is a residential vocational training centre on the airport campus which trains over 500 youth every year in different trades. The Centre is equipped with classrooms, dormitory, work sheds, mess, library, recreation room, seminar hall, etc. The Center offers courses of short duration …ranging from 2 to 6 months. The training is provided free with preference being given to candidates coming from villages affected by the airport. After the initial socio-economic background check, candidates are selected based on an entrance test and a personal interview. As a policy, technical courses are offered in partnership with academic or industrial institutes to deliver the most industry-relevant content. Thus, Refrigeration and Air-Conditioning course is offered in partnership with Voltas, Micro-irrigation with Jain Irrigation, and Electrician training with Schneider Electric etc. It is the partners who design the curriculum, provide technical expertise, equipment and crucial components at on-the-job training as well as placement support. Besides the technical training, emphasis is laid on personality development and workplace readiness. Regular yoga, spoken English classes, soft skill modules, and mock interviews help the trainees in getting work-ready. The Institute trained more than 2400 youth (1570 male and 830 female) so far and 2153 (1398 male and 755) of them settled comfortably. Some of them are working in Middle East in the field of Refrigeration and Air Conditioning. Some of them secured placements in companies like Voltas, Hero Motor Corporation, Vijaya Electricals, BIG Bazar, BL Kashyap, Volvo Excavator contractors and Schneider Electric etc. with salary ranging from Rs. 4000 to 12000/- per month. The Institute has reputed partners like Voltas, Volvo, Schneider, Hero Motor Corporation, VLCC and othersAbout 800 youth trained from villages surrounding Hyderabad Airport are placed with different concessionaries in the airport. Centre’s work was an important component in GMR Group bagging awards including Best CSR Activity to Rajeev Gandhi International Airport at the World Routes Conference in 2008 and TERI-CSR Award for Best CSR in 2009. The Institute has Vocational Training Provider (VTP) status to conduct Modular Employable Skills (MES) curriculum to issue Govt. of India National Council for Vocational Training (NCVT) certificate. More than 350 trainees received NCVT certificates.